Well, many thanks to @stillshunter because his question started this thread which prompted a check of eBay which led me to this Western Flyer, now (or soon) winging its way to me. The Western Flyer sits between my Cadet and the TriStar and will become my default overnight bag I suspect. As speced with the gray whistle sternum strap (which I will NOT use), short key strap and long key strap we are talking $USD338 to get here new - about $A450. So this price is not bad. Been thinking of getting one for a while but could never justify it, at this price I could not resist! Wow, nice one @Mark1966 ....it's not often the enabling happens the other way. Happy for the diode to be broken. Nice bag BTW! Looks like a nice range of bags. Last thing I need to allow my eyes to wander over, considering I've more than one bag already! Yes, yet you need them to adapt to different requirements. Until I met wifebert I used to frequently travel around the warmer parts of the world for weeks on end living out of a 20-25 litre backpack, but with her and a toddler in tow I've realised that something a little larger is required. I've been looking at backpack carry on luggage quite a bit recently as having to herd wifebert and toddlebert while simultaneously pushing everyone's luggage and carry on bags is just too much for one person to cope with. I've not quite sold the wife totally on one bag travel theory, but I at least for get interested, until she saw the prices of the nice gear. 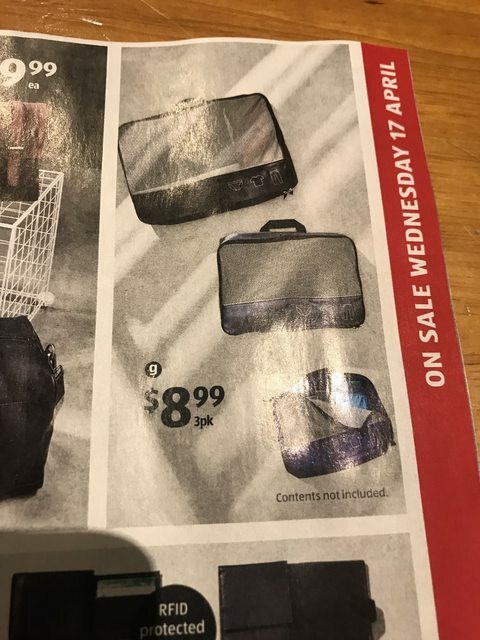 No Tom Bihn, Minaal, Tortuga / Kickstarter one bag luggage for this family it seems, so I've been looking at the bargain bin section of the internet. There's currently a nice looking bag on Kickstarter called the bagram which starts at a reasonable $79usd, but when you add a few extras, like hip belts it soon adds up in cost. MEI packs look incredible value for money especially as you can customise them, but postage adds up. Locally, I ended up looking in the 2nd hand market as a lot of people seem to buy such products but only use them once or twice. Clam shell opening, tech sleeves, hideable straps, and carry on size. Got to wait until October for our next trip but looking forward to trying this bag out. Now to find where the best deals on packing cubes are. I have a larger Osprey Waypoint 80 (for a lot less than that price) which is my 'go to' overseas travel bag. The clamshell opening is great, mine has the daypack which I use for carry on and then it can either go on the back of the backpack or clipped on the straps to hang down on my chest. Either way it means you get lots of space AND YOUR HANDS ARE FREE - important with kids and all those other things to do. Much more convenient on and off transport too. Even in a crowded tube train I simply carried it by the top handle and was no more of an intrusion than a bag. Good choice at a great price! I'm pretty impressed by their lifetime warranty too. And you're not the only one, my friend! Well, a bloke has to carry every available lens... and then there's the backup camera... 4-5 spare batteries... the pod... the flash x 3... and on it goes. I have only recently stopped carrying a 300X tele... the weight has started to get to me... don't really use it all that often anyway. Great post, Eggs! Always looking for recommendations such as this. And you gave me a good laugh with your reference to Mrs Eggs . Cheers Tom, yeah I tend to do a lot of research, get jealous of people like @Mark1966 who can afford/ justify shipping in a different market to me. Oops that last post was supposed to have a lot more in it. After realising I'm not in the same market, my drivers then tend to be what products are the best value for money at market value, then look for deals on them. I was at first way of buying luggage 2nd hand but the previous owner insisted she had only used the bag for 2 weeks, and it looks in immaculate condition. The only issue at the moment is that it smells like she spilled a big bottle of perfume in it (she didn't, it just is a bit strong in the nose a the moment and will hopefully disappear with a bit of sitting). Hopefully after seeing this work well wifebert will be sold on the idea and we can look for a new bag for her. And by that I of course mean look for an upgrade for me and hand down the osprey to her. Two of my three Tom Bihn bags were second hand @eggbert - and I didn't pay anywhere near that Paddy Palin price for my Osprey. We have an IKEA in Canberra now. Happy to get some of those packing cubes and send up if you PM me. 3 TB bags now eh? I remember the hemming and hawing over the TriStar but it must have really won you over. What else did you end up with, a Synapse? There is pretty much no work trip I cannot do domestically with these in various combinations depending if I'm taking staff like a data projector etc. So I'm up to Sydney overnight with papers, computer and date projector in my Western Flyer. Other times I take either the Western Flyer or TriStar for clothes etc and the Cadet for computer and papers. Have come late to this thread, does that Tom Bihn laptop bag cache thingy hold a 15 Alienware Laptop? It's a beast of a laptop. Like the idea of fast through security. Cheer Mark, sent them a message, I think the 15" MacBook Pro is the largest, that is a dwarf next to my Alienware. Good looking bag that cadet though. I know somebody was looking for some of these a while back, cannot immediately recall who it was.